The autobiography of America's greatest living record man: the founder of Sire Records and spotter of rock talent from the Ramones to Madonna. 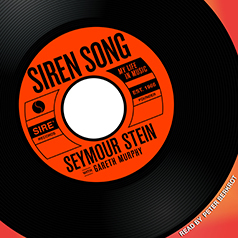 Seymour Stein is America's greatest living record man. Not only has he signed and nurtured more important artists than anyone alive, now sixty years in the game, he's still the hippest label head, traveling the globe in search of the next big thing. Since the late fifties, he's been wherever it's happening: Billboard, Tin Pan Alley, The British Invasion, CBGB, Studio 54, Danceteria, the Rock and Roll Hall of Fame, the CD crash. Along that winding path, he discovered and broke out a skyline full of stars: Madonna, The Ramones, Talking Heads, Depeche Mode, Madonna, The Smiths, The Cure, Ice-T, Lou Reed, Seal, and many others. Brimming with hilarious scenes and character portraits, Siren Song's wider narrative is about modernity in motion, and the slow acceptance of diversity in America—thanks largely to daring pop music. Including both the high and low points in his life, Siren Song touches on everything from his discovery of Madonna to his wife Linda Stein's violent death.